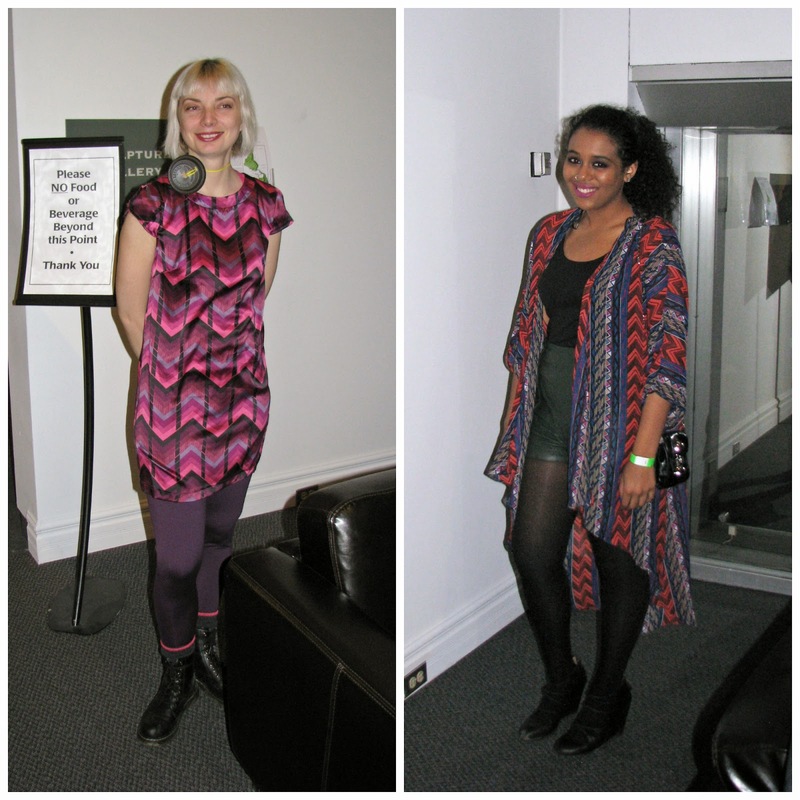 On Thursday, March 20th, Museum London teamed up with DHMakerBus for The MAKE London Wearable Technology and Made Clothing Fashion Show. 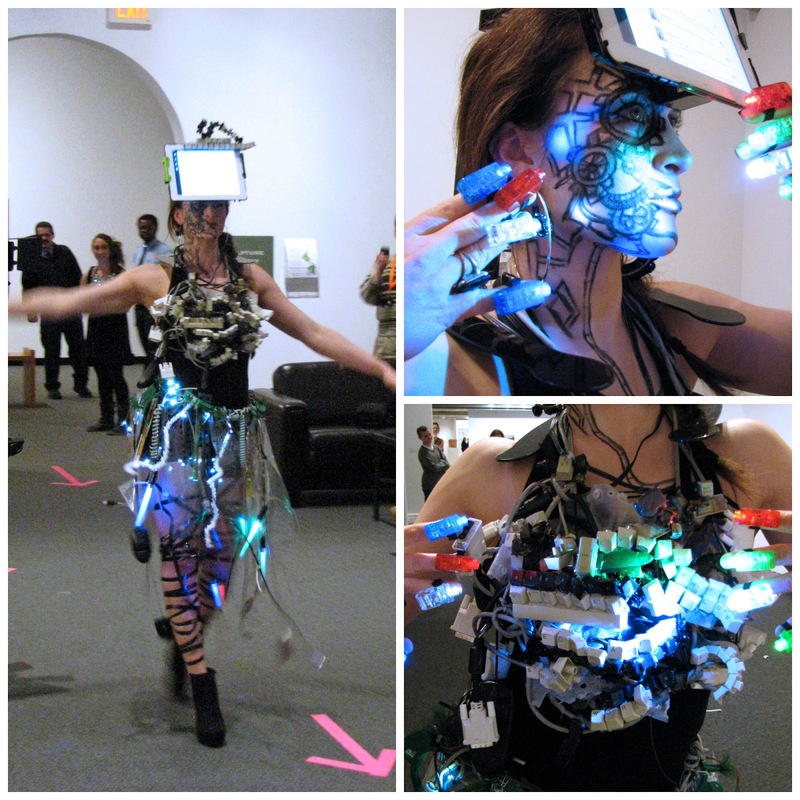 The purpose of the show was to "showcase fashions that are created from unconventional or upcycled materials, and those that involve technology and wearable computing." The show included booths with items for sale, a bar, DJ and three craft-making stations where participants could get creative with items such as coffee cup lids and Fringe Festival t-shirts. The first person I saw when I arrived at the event was Linda, who I run into at many arts and culture events and she is always wearing something wonderful. 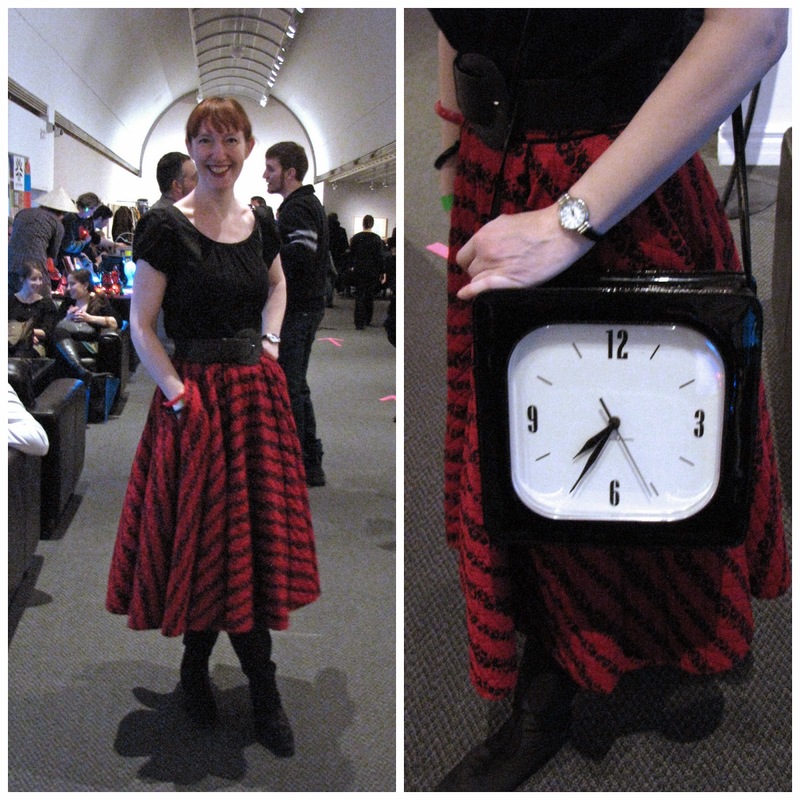 This particular night she was wearing a quilted circle skirt she had purchased in Kensington Market, accessorized by a very cool "clock purse". I didn't get a chance to ask her where she found the purse. 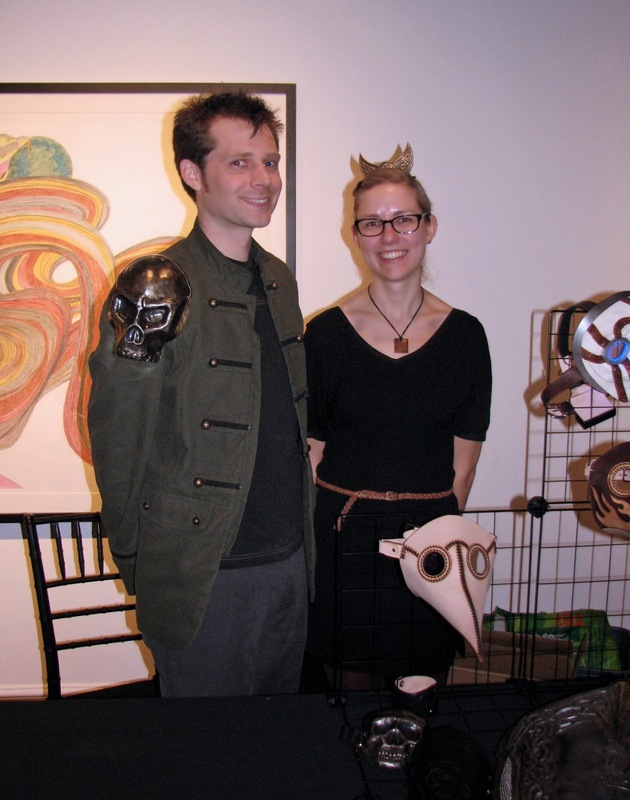 The man on the left is Ryan Consell, who made the masks at his booth, some of which were in the fashion show. You can see more of his work on his Etsy shop . Kimberley Martin and Beth Compton, co-founders of the MakerBus, make jewellery from found materials, including LEGO pieces. 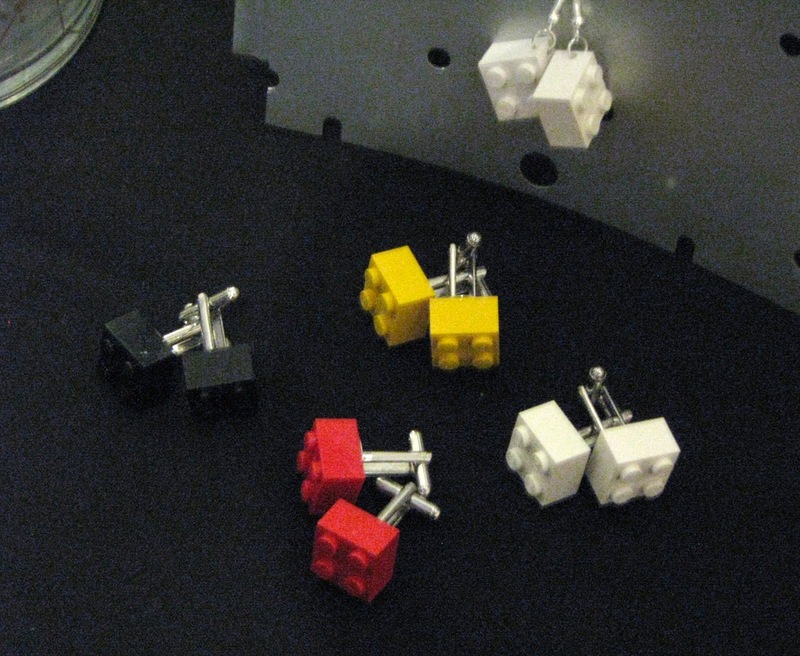 I love the cufflinks, but as I don't have the appropriate shirts to wear them with, I purchased a necklace made from LEGO pieces. Usually at events like this, the majority of the guests opt for wearing black, but I was happy to see there were some bright splashes of colour amongst the guests. The woman in the photo above was wearing one of the coolest accessories of the night. 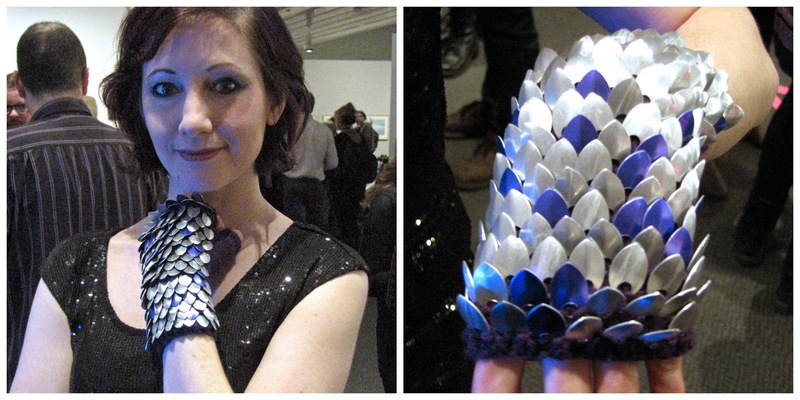 Her boyfriend purchased the "dragon-scale" fingerless glove from a seller on Etsy for her. I didn't know people were making such things, but you can find them in elbow length, and many different colours. 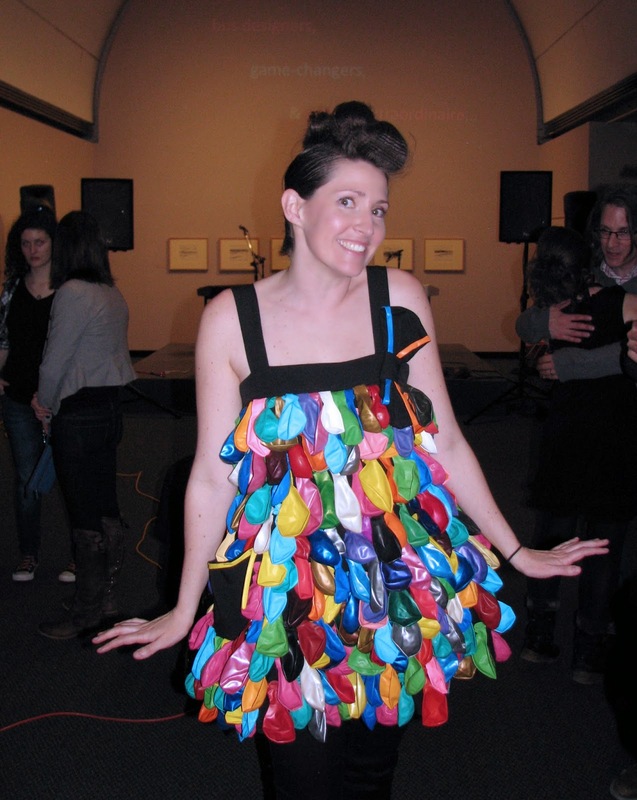 Toronto artist Paula John's Celluloid Dress was one of the most interesting displays at the event. 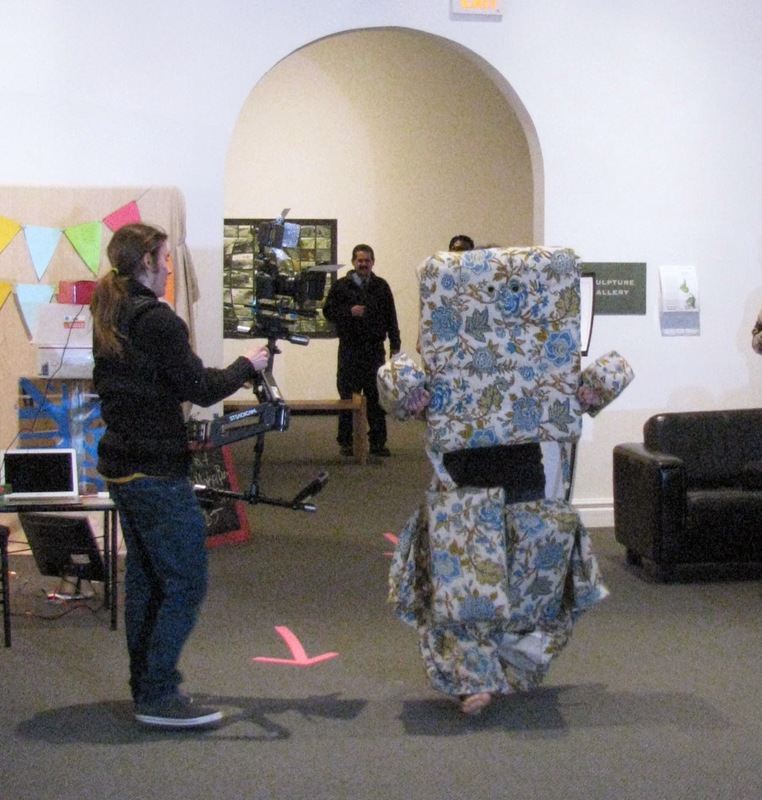 The dress combines the two technologies that John uses in her art practice - sewing and film making. The dress, which is in the style of a 1950's cocktail dress, is made of approximately 250 feet of 16mm celluloid film and nylon mesh. 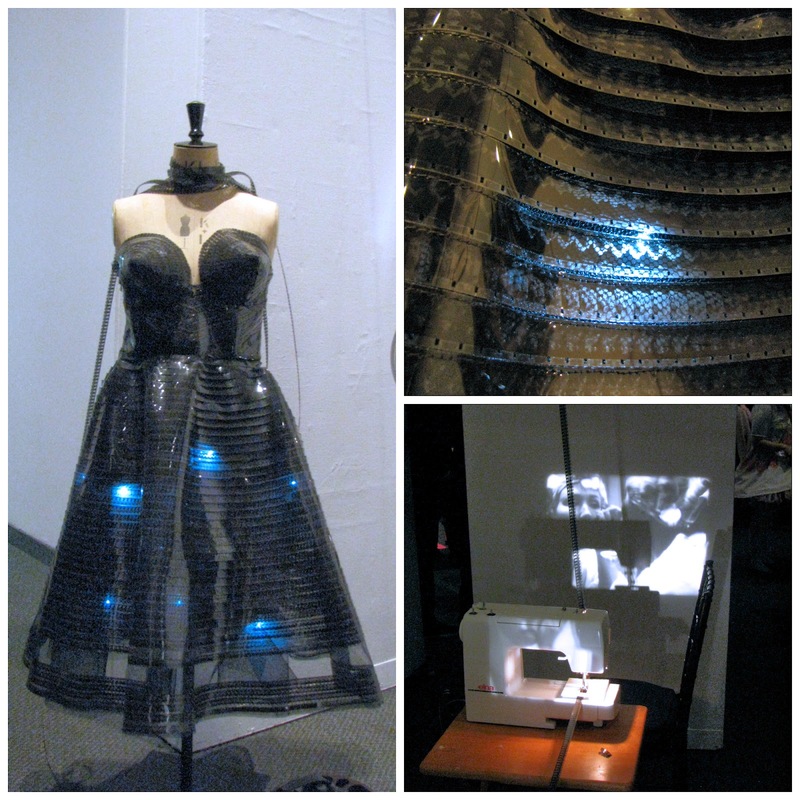 Battery pack operated LEDS are sewn into the dress's underskirt to light up sections of film. In the display, John's film, "Becoming Marilyn" (of which the dress is constructed) follows a large loop through the projector, across the ceiling to feed down into the sewing machine, and then back across to the projector. The film, which depicts the artist making herself up to look like Marilyn Monroe, is projected onto a white wall positioned behind the sewing machine. Agnes Niewiadomski makes custom order cakes, costumes that she wears to Anime North in Toronto, and makes props, costumes and designs sets for her local community theatre in Ancaster. Little wonder her website is titled agnesmakes. 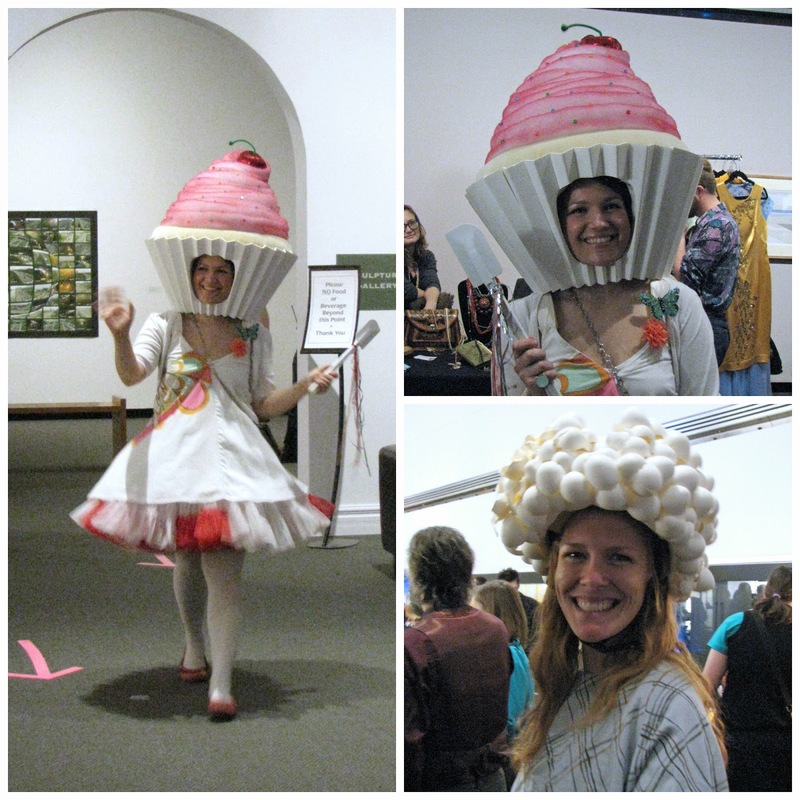 For the MakerBus event she brought her Cupcake Head costume. 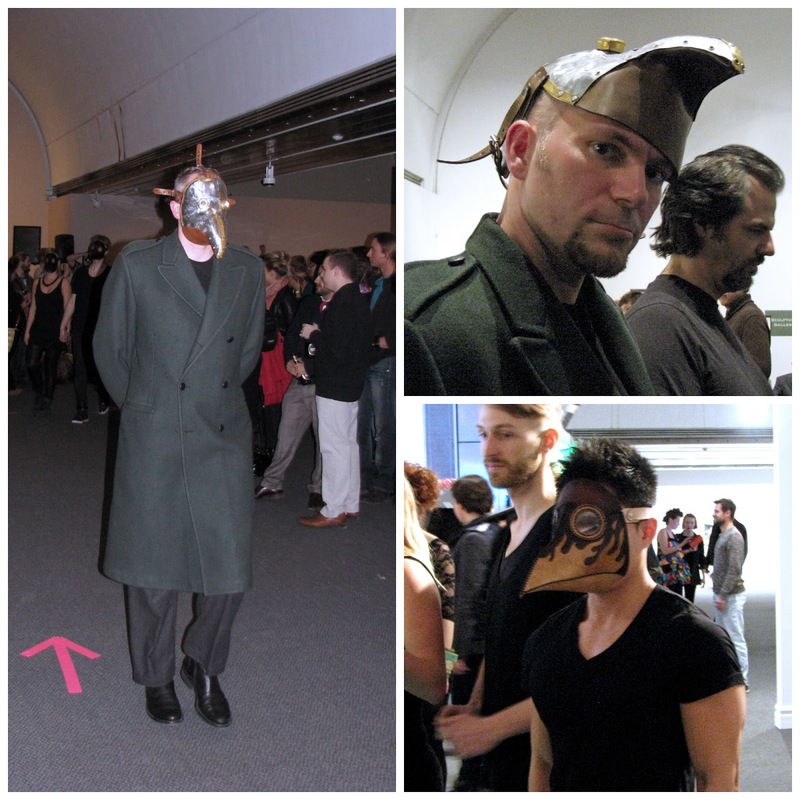 She also made the cracked eggs headpiece worn by another model in the show (lower right photo). One of the actresses from Evil Dead: The Musical, which will be presented at the McManus Theatre from April 1 - 12th, participated in the Fashion show wearing a costume piece from the show. There was a table at the event with some of the other props from the show on display. 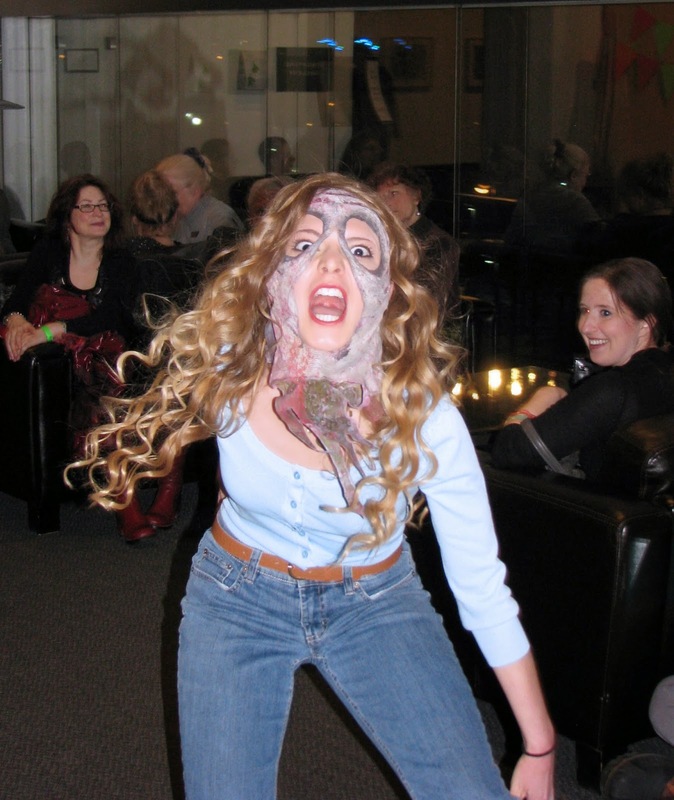 One of the most elaborate costumes was created and worn by Laura Briscoe, a teacher at Oakridge Secondary School. Her submission was titled "Miss Communication". I spoke with her after the show and asked how long it took to put together the costume. "It took hours and hours. The hardest part was prying the keys off the keyboards and then fusing them together with a blowtorch". 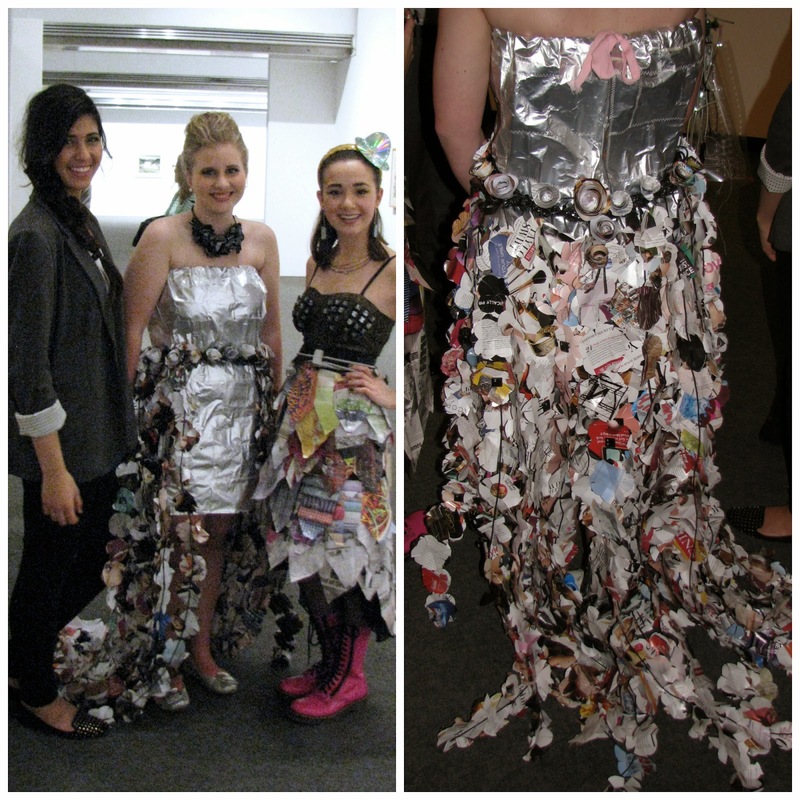 One of Laura Briscoe's students at Oakridge, Jamie Smith (far left in left hand photo above) submitted two outfits for the show, which were worn by fellow students. On the right is a detail shot of the train on the student in the center, which is made of flower shapes cut from magazine pages. Randi Aiken created, and modelled, the walking chair, which was constructed so that when she sat down on a piece of the wood frame in the back, the upholstered pieces came together to form a completed chair. 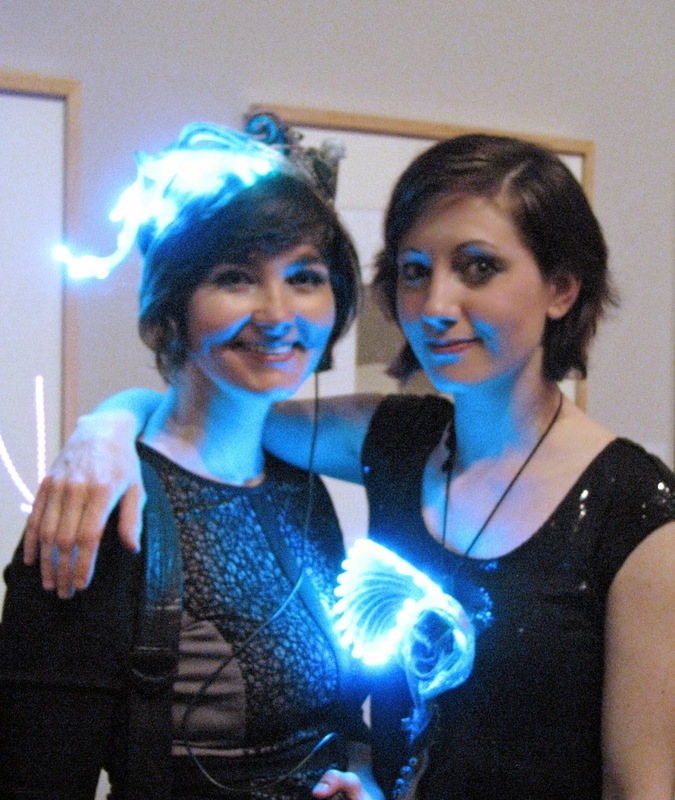 LED sculptures created by Kitchener LED tech installation artist Bernie Rohde and K La Luna, modelled by La Luna (left) and friend. Another artist using LED lights as a medium was Leslie Birch from Philadelphia. Her Bladerunner-inspired FLORAbrella uses 144 LED lights and a colour sensor which enables the umbrella to create light patterns to match the user's clothing. 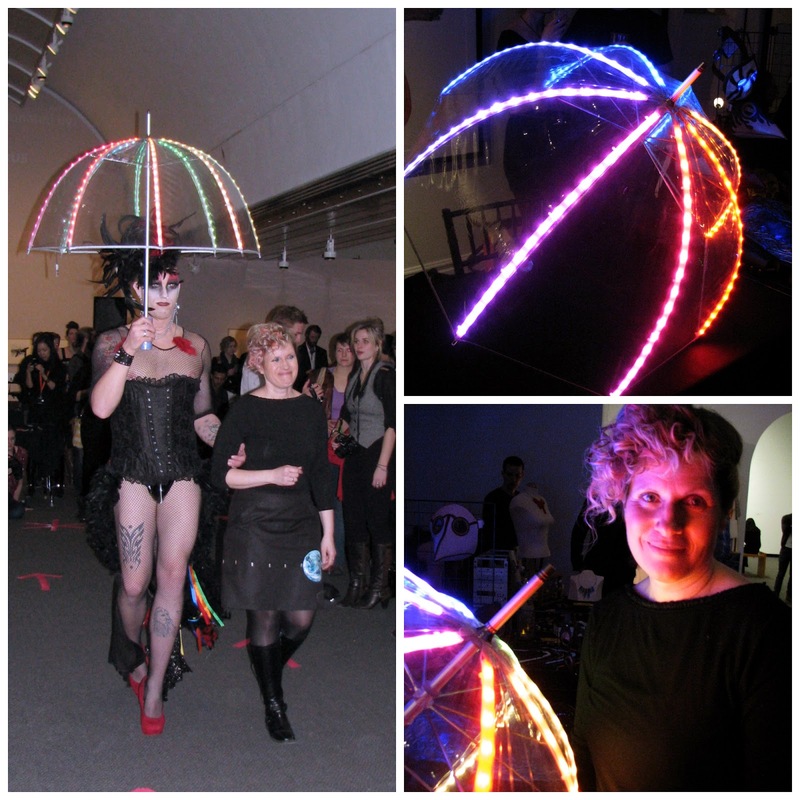 In the photo above left, Birch walks with the model carrying her FLORAbrella in the fashion show, and in the lower right photo, is illuminated by her creation. 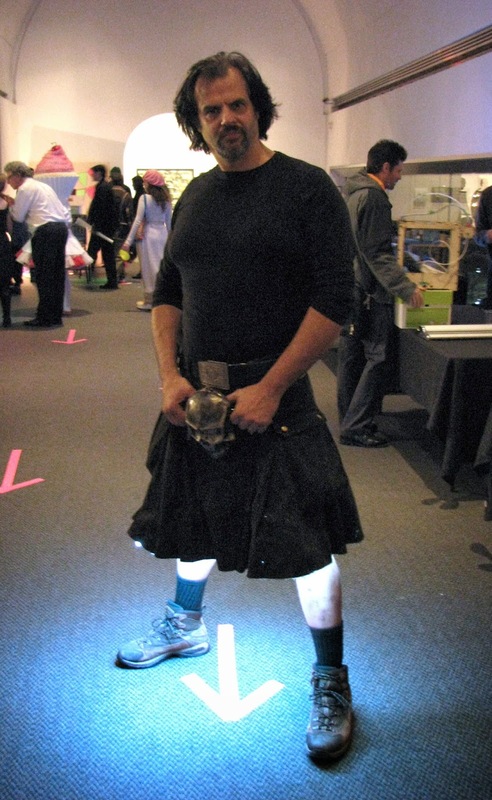 Another creative use of LED lighting was demonstrated by Paul Graham, whose kilt was lit from below with LED lighting. 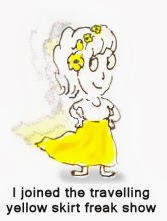 He offered to create customized LED lighting I could attach to the crinoline I was wearing, and I was tempted to take him up on his offer; it would give a new meaning to the the word "flashing". After the fashion show I wandered over to the "Maker" area where tables were set up and people were letting their inner crafter loose. 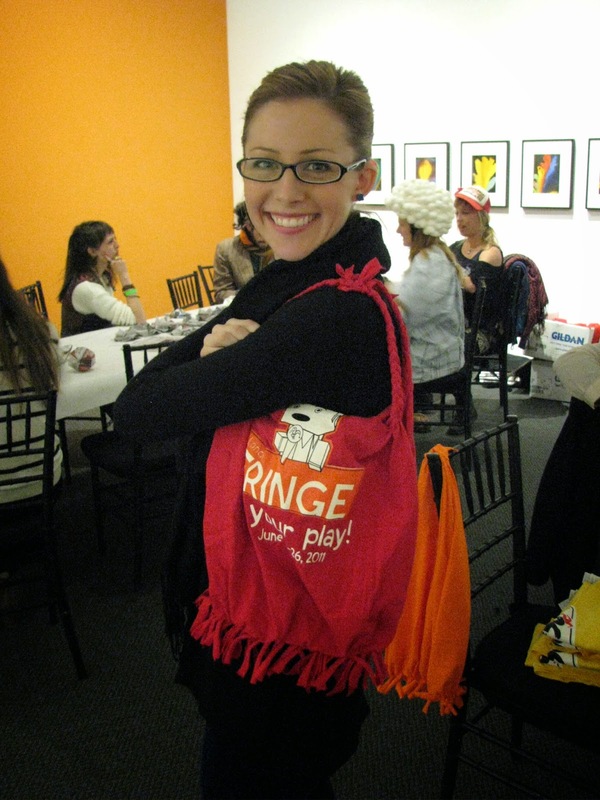 Alison, who works with the London Fringe Festival, modelled one of the bags that were being made from recycled Fringe Festival T-shirts. 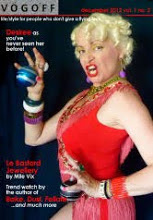 It was an excellent night out - was able to see interesting things that people made, talk to some of the people who made them (and discovered that Leslie Birch and I share a love of the 1980's clothing shapes and colours), and was home by 10 pm. That's my idea of good time! I would love that lighted umbrella! The dragon scale hand is cool. 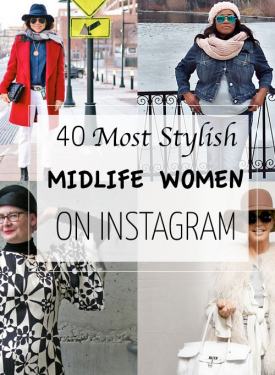 What a strange group of fabulously dressed people! Love the clock purse especially. Lego, and film, and cupcakes, and floor lighting supplied by whatever's under a man's kilt!!!! Wow, there are some uber creative people in London! I loved all these amazing things you showed us. The outfit of the circle skirt and clock purse is fabulous, and when can I buy an umbrella with LED lights? That would make the rain so much more fun! Very cool indeed - what creativity. I want that umbrella! What a great event! All of that creativity and awesomenss in one room! I wish we had something like that around here. it really seems you had a great time, enjoying so much creativity and funny people, lovely and inspiring pieces and such amazing ideas!, attach some leds to a crinoline! !, that's my kind of Fashion!! What fun! That "film" dress is incredible. London looks like it has a very strong Arts community. That looks like so much fun! I love those kind of exhibitions! Thank you all, It was an absolute riot doing this show. FYI, http://www.ebay.com/sch/i.html?_trksid=p3984.m570.l2632.R2.TR4.TRC2.A0.H1.XLED+Umbrella&_nkw=led+umbrella&_sacat=155184&_from=R40 is one source, and we can make umbrellas like that pretty easily. (Or whatever your wearable tech needs like that would be. Such incredible creativity and imagination! What an event! The creativity leaps from the screen. Love the fingerless glove art and Miss Communication. London looks to be a 'happening' city! Shelley you go to the coolest events and then you actually appreciate the beauty in everything and everyone and share. I could just kiss you! I'm loving the balloon dress because it's weird and colorful and I wanna touch it. I wonder if portland has something similar. This is such an amazing look, black, brown and white Tunics and leggings original and different!